The Dobermann or Doberman Pinscher (also, more colloquially, Dobie) is a breed of domestic dog. Dobermanns are commonly used as guard dogs, watch dogs, or police dogs, and have a reputation as being a dog that is incredibly loyal to its familial duties and that is vicious if crossed. 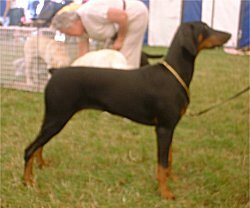 Because of the Dobermann's typical use as a guard dog, and its often stereotyped role as such in movies, many people are afraid of Dobermanns; most do not understand that Dobermanns are, in general, a loving and intelligent breed that rarely attacks people except when it feels that it or its property or family are in danger. A female Dobermann's shoulder height is about 24 inches (61 cm) and weight is about 75 to 80 pounds 34 to 36 kg), whereas the male stands about 26 or 27 inches (66 to 68 cm) at the shoulder and weighs around 90 pounds (41 kg). Most people picture a Dobermann's color as the typical black with brown markings. However, the existence of two different color genes in Dobermanns provides four different phenotypes in Dobermann color. The traditional color, produced when both genes are dominant, is commonly referred to as black, while the most common variation, due to one gene's being recessive, produces what is called a red Dobermann, which is primarily reddish-brown with tan markings. The other gene's being recessive, while the first one remains dominant, produces the blue (grey) Dobermann, whereas the least likely combination of both color genes' being recessive produces fawn, which is a light tan color. What may come as a surprise to people who are used to seeing Dobermann tails that are just a couple of inches long, is that the Dobermann is actually born with a tail that is longer than that of most breeds of dog. Typically, a Doberman Pinscher undergoes docking, a procedure in which the majority of its tail is cut off within days after its birth. The rationale for this is that it is the "look" that the dog is supposed to have, since it was the way Louis Dobermann originally envisioned the dog. It also gives the dog an appearance of ferocity and toughness. Aside from these more vain reasons of putting the animals through a procedure that many view as inhumane, one practical reason for docking the tail is that it removes what would be a convenient "handle" for a criminal or attacker to grab when the Dobermann is performing its guard or police work. Regardless of people's beliefs on this matter, few Dobermann purchasers have a choice on the length of their Dobermann's tail; docking must be done soon after the dog's birth, which means that the breeder nearly always makes the decision, before their dogs are even put on the market. This is not true, however, of Dobermann ear cropping, which is typically done up to six months or a year after the Dobermann's birth, and is therefore usually left up to the discretion of the dog owner. In larger and larger numbers, Dobermann owners are opting not to have their pet's ears cropped, in a procedure that is believed to be extremely painful for the animal. The process involves cutting off part of the animal's ears and then propped them up with sticks and tape bandages, which allows the cartilage to develop permanently into an upright shape as the puppy grows. The process takes months, and the animals often bleed through the tape, which is unattractive.